Have you ever thought of sending messages that will self destruct just after being read? This kind of scene yo may have seen in Mission Impossible. Whenever we are sharing secret sensitive information, we need to have a way to send self destructive messages. This helps in making the sensitive information secure from unauthorize access. If you want to send self destructing messages online, you can use NoteDIP. NoteDip is a nice online service that allows users to send send destructing messages. Users can also add a password to the messages. If you want to know when the user read the message, you can also set the email notification. The service is very simple to use and does not ask for registration. Visit the NoteDip and you will find a big text area where you can write your secret note. 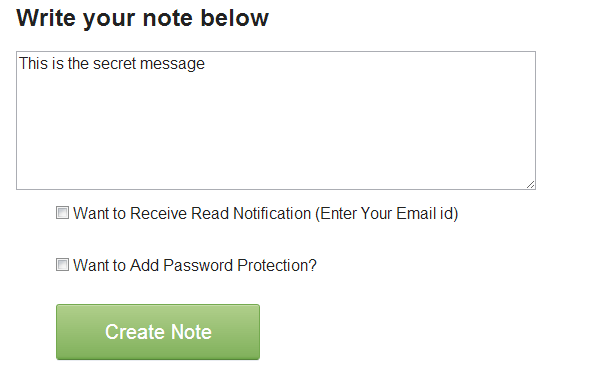 After writing the note, click on the Create Note button. If you want to receive notification, just select the checkbox and add your email address. If you want to add password protection the note, select the second checkbox to add password. After clicking on Create Note button, it will generate the message URL. Copy this URL and send it to the person whom you want to send this self destructing note. After click on the URL, the person will be able to see the secret message. After the message was first read, the message will be expired and no one will be able to read the message. This is a nice tool if you are going to share a secret information. This tool does not protect users from copying the message because it is hard from preventing users to snap the screen. Still NoteDIP works fine and you can enjoy with is. Share your views about this tool with us via comments.